← How to fill job application form easily? Question:I was searching about 3 hours to find a solution to my problem. I already browsed trough questions regarding my problem but could not find a solution.What I'm currently trying to do is to replace text in a PDF form field. The PDF file has a text field containing a placeholder text.My question now is: Is there a simple and effective way to implement this? I don't want to use FDF but instead replace the text right in my source PDF. Is there any solution on VeryPDF? Answer: According to your needs, maybe you can have a free trial of this software:VeryPDF PDF Editor, by which you can replace text in PDF form field. This software is GUI version, so you can replace text directly on input PDF form and save it as new PDF. Please note all the PDF form here we refer to is flatten text based PDF form as interactive PDF form could be filled by any kind of PDF reader. By this software, you can also edit text, hyperlinks and other elements of PDF, and add comments and annotations to PDF. It can also convert PDF to other formats. Please check more information of this software on homepage, in the following part, let us check how to use this software. This software is Window GUI version, so when downloading finishes, there will be an exe file. Please install this software by double clicking the exe file and following installation message till short cut icon showing up on desktop. Step 2. Replace text in PDF form field. When you open software interface, please click button Open to add PDF form to software interface. Click button Edit Content and then you will find that mouse will turn to cross. Please draw an area around the PDF form field where you need to replace text. I take an example in above snapshot, please have a check. Once you click there will be red box around the PDF form text. Please right click the red frame and there will be dropdown list, please choose Property then you will see the menu tab like I showed above. Please go to text part, now you can replace text according to your need. Please do not change other option, then the text will keep save with original. However, if you need, here you can change font size, color,position and others. If you have finished, please click button Save to save it as a new PDF form. 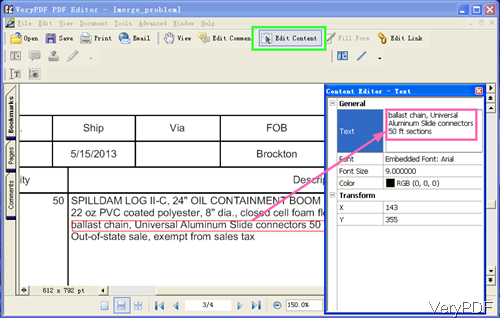 By this method, you can replace text in PDF form field. During the using, if you have any question, please contact us as soon as possible. Information on VeryPDF Cloud API. What is the difference between Cloud API Plans? This entry was posted in VeryPDF Cloud API and tagged replace text. Bookmark the permalink.